Fine Cooking is a magazine that is good for the home cook who is looking for ways to improve their culinary skills and bring their meals up a notch. 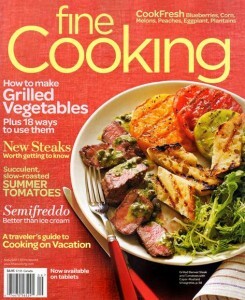 This monthly magazine provides recipes that are not complicated for those looking for easy dishes to cook up. Additionally, it is a great resource for people looking for recipes that are a bit more challenging. The photographs are beautifully done and are accompanied by eay to follow and detailed recipes. Fine Cooking is published bimonthly by Taunton Press. This one is more high brow for sure that the typical food magazine but I still secretly like it a lot. Tons of great info – sure, some I’ll never use but you never know! Does anyone know if Fine Cooking has easy to follow recipes? I want to start cooking some fancy meals but I don’t know if this will be over my head.. This magazine has so many good recipes that I can actually make! I wish it came out monthly instead of every other but I don’t mind waiting, that’s how good it really is! I`m subscribed for 3 months and I`m very satisfied. A lot of easy following recipes. Recommended! I always find the recipes they got in Fine Cooking interesting. They have mix easy to prepare meals as well as those not very common. Perfect for parties or family gatherings.